With an overall scroll embroidery and scalloped bottom edge, Hathaway remains a favorite among our customers. This elegant semi sheer is versatile with all its matching components. The Double Scalloped Valance looks beautiful paired the the panels, but also looks great on its own. Try a matching pair of tier curtains, or for a different look, go the the Balloon Curtain. Panels are 54" wide and come in lengths of 63", 84", and 95". Tier Curtains, 54" wide to the pair, come in 24", 30" and 36". Panels and accessories have a 1 1/2 inch rod pocket 1 1/2" header, and 1/2" side hems. Use a one inch curtain rod for panels. Use a Double rod for hanging balloon curtains or valances, or a triple rod for both. Machine wash, gentle cycle. 100% Polyester. Our pretty embroidered semi sheer Balloon Curtain has 1 1/2 inch header (ruffle above rod), 1 ½ inch rod pocket for using a standard one inch curtain rod, ½ inch side seams, scalloped bottom, and four columns of adjustable rings that adjusts to any length. 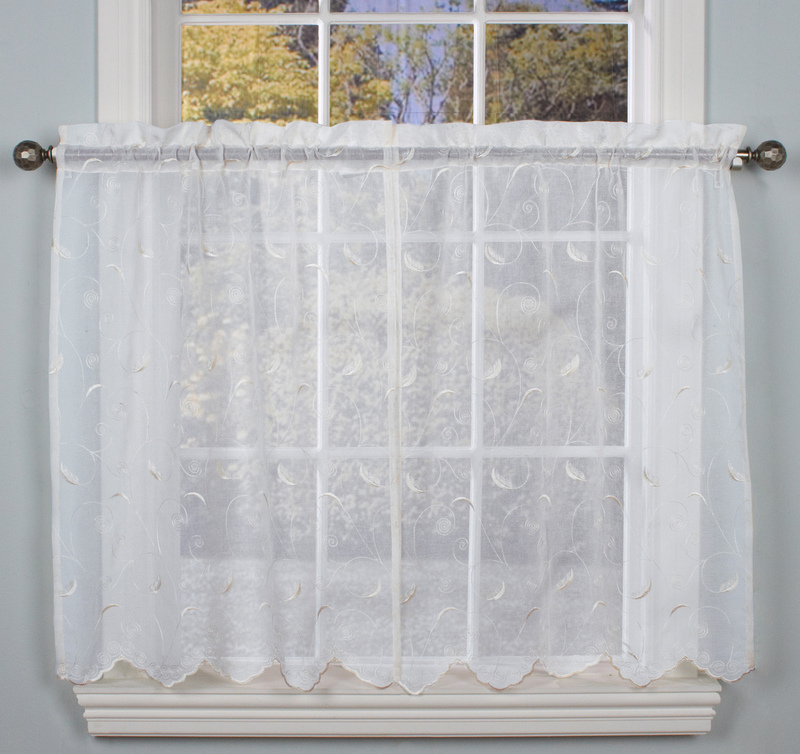 Double Scalloped Valance has 1 1/2 inch header (ruffle above rod), 1 ½ inch rod pocket for using a standard one inch clear or white curtain rod, and double scalloped bottom edge. Washable. Tailored Tiers have a 1 ½ inch header (ruffle above rod), 1 ½ inch rod pocket for using a standard one inch clear or white curtain rod, ½ inch side hems, and scalloped bottom. Add a Tailored Valance for a pretty kitchen curtain ensemble. 100% Polyester. Machine wash cold water on gentle cycle. The Hathaway Semi Sheer sheer curtain ensemble is embellished with scroll motif embroidery. Elegant, delicate looking, yet this 100% polyester curtain collection is washable. 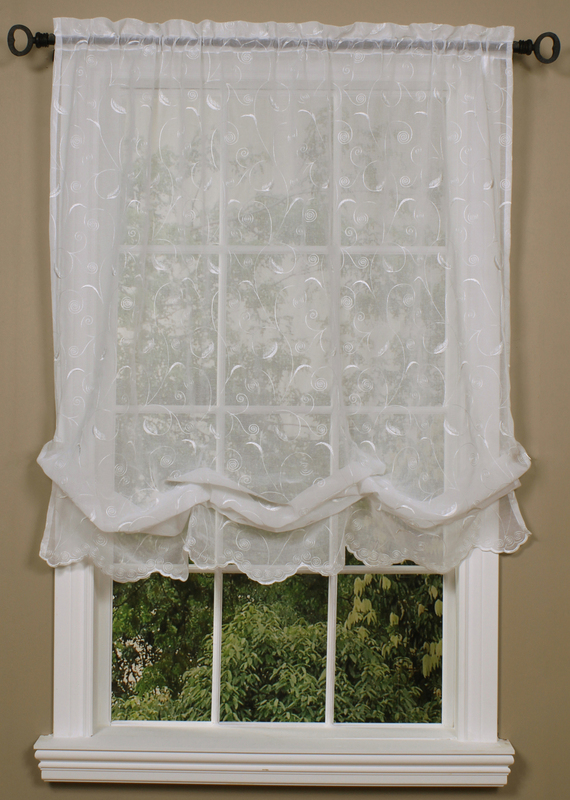 The tailored panel and coordinating double scalloped valance have an embroidered scalloped bottom. The balloon curtain has four columns of adjustable rings with embroidered scalloped bottom edge. These curtains each have 1 ½ inch rod pocket. 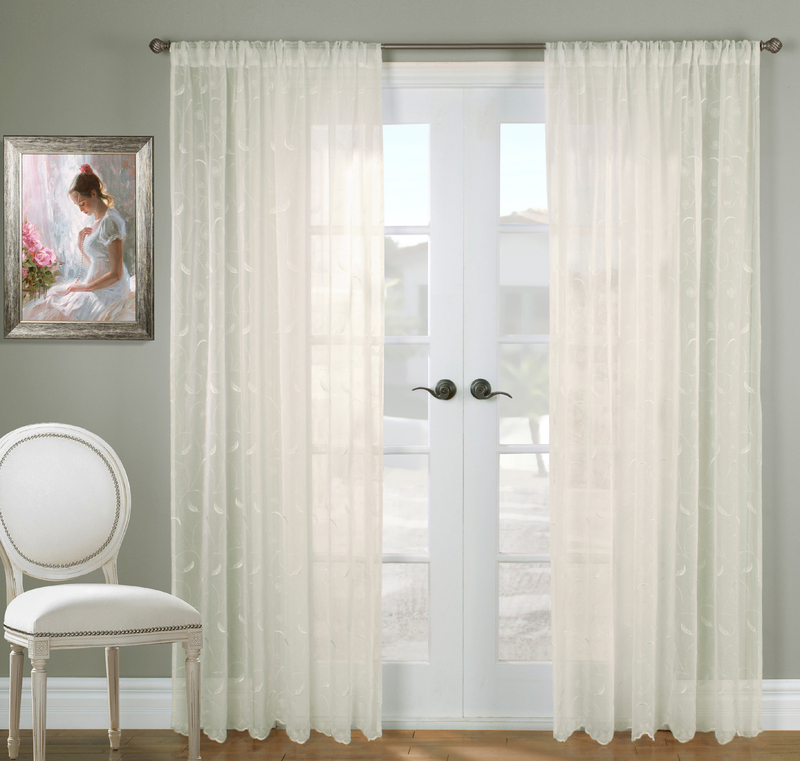 Use a standard one inch clear or white curtain rod to display this stunning ensemble. Pair the double scalloped valance with 24 inch, 30 inch, or 36 inch tiers to create a beautiful embroidered kitchen window curtain.